BetOnline has been in operation since 2004 but it’s history and management team date way back to 1991. They are an offshore sportsbook which is licensed and regulated in Panama City. We are reviewing their site in August of 2018 and as always we will update any changes or news to the sportsbook if something happens to arise. When you are in the sports betting business for as long as the team at BetOnline you don’t survive without a hardworking team and great customer service. They have built a great reputation over the years and have become one of the most trusted Sportsbooks online. That’s not to say there haven’t been some up and downs over the years. You still may find some backlash or negative opinions about BetOnline from a few mis-steps back in 2011 with their Poker product. You can google it all if you like but I’m happy to say since then the company has turned it all around and they are 100% a legit and safe betting site for customers. They are now one the largest Sportsbooks online and accept US players which is a huge plus for players from the states looking for a trustworthy option. For any new players joining BetOnline for the 1st time you get a 50% bonus up to a maximum of $1000. This means that if you deposit $100 then you will get rewarded with $50 extra into your account. 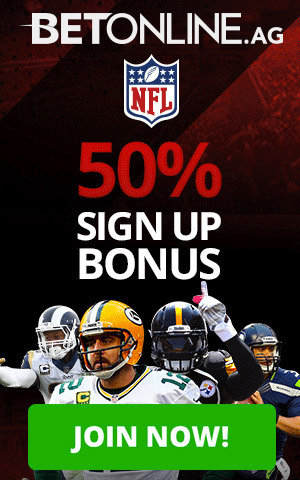 The minimum you must deposit to qualify for their welcome bonus is $50 and you can use the BetOnline promo code located on the welcome screen here. The bonus is pretty standard at %50 but the limits are higher then you will find on most betting sites so that’s a nice positive. The downside is that it comes with a 15x rollover requirement before you can withdraw any winnings. I find that to be on the high side but if you plan on using BetOnline as your primary sportsbook it shouldn’t deter you too much. *Visit BetOnline for full bonus details and requirements. Next let’s dive into one of the most important factors of any betting site and that’s what you can actually bet on including unique bets like Futures and Parlays. BetOnline has all the main sports and then some including unique markets like Esports, Lacrosse and Darts. 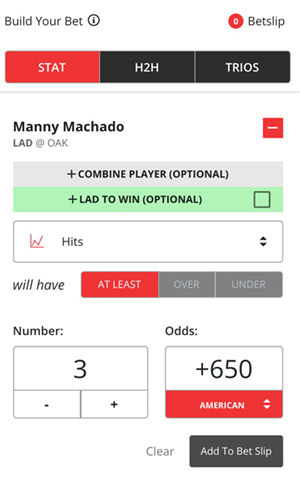 One of the newest and innovative additions to the BetOnline sportsbook is the Player Prop Tool in which you get to build your own custom props to bet on. This is the newest innovation in sports gambling and a lot of sites are starting to add this type of tool to their site. BetOnline’s works very well and is really easy to use. Stat Based – a bet on a single player(s) to reach a certain statistical performance or not make a specified performance. For example, Stephen Curry will make over 10 assists or Tom Brady will throw at least 2 TD’s. Head to Head – create a bet between two players where one will outperform the other. For example, Lebron James will have more rebounds then Kevin Durant. Trios – this is similar to a trifecta bet in horse racing where you are selecting players to finish in a top 3 order. For example, Julio Jones will finish 1st in receptions, Antonio Brown 2nd and JuJu Smith-Schuster 3rd. Overall this is a great feature at BetOnline and if you are sharp with your player prop knowledge you can really find an edge here I think. VISA Gift Cards and prepaid cards can be used provided they are specifically allowed to be used for international online purchases. Mastercard Gift Cards and prepaid cards can be used provided they are specifically allowed to be used for international online purchases. Bank Wires will be credited immediately upon receipt of transfer, usually in 1-3 days. Your account will be credited instantly when you send money from your Skrill account. Your account will be credited instantly when you send money from your Neteller account. Person to Person transfers are international money transfer systems for sending funds between individuals. BetOnline will cover the fees for deposits of $300 or more. You may send cashier’s checks from your bank to BetOnline via FedEx, UPS, DHL or any other next-day courier. Using Ethereum is a simple and easy way to fund your account. Litecoin is a revolutionary cryptocurrency that is designed to ensure fast deposits and payouts. Use Dash to make instant, private payments online. Decided to split from Bitcoin Original Blockchain thus creating two different Cryptocurrencies whom they called Bitcoin Cash. As you can see there is a diverse number of options available to you and you can use whichever deposit method you feel most comfortable with. On to withdrawals or payouts. BetOnline is known for their fast payouts which is a huge positive to any gambler, we want our money and we want it quickly. BetOnline does a great job with regards to timely payouts. That being said the negative with their payout system is they do not offer many fee less withdrawal options. Unless you use cryptocurrency you will have to eat a small fee when you withdraw any money. It would be great to see them change this policy as it is the one big critique we all have when reviewing their otherwise first class betting site. Account credited within 36 hours, only available if you also deposited using Neteller. Fee of $26 to $101 applies. Courier delivery ensuring you will receive your check within 7 business days. The fee is $50. Very fast, usually under a week but they say can take up to 15 days depending on bank. Bank fees may apply. Account will be credited within 24 hours, no fee. When I review the actual navigation of a betting site I’m looking for two main things – How easy is it to find betting markets? and How easy is it to place a bet? At Betonline, it really straight forward to find the different sports and options you can bet on. Your betting menu is located on the left side of their website and the betting slip on the right. When you click through the different markets the odds will display in the middle. Straight forward and simple, nothing really to knock as far as display is concerned. I’m not a huge fan of their checkmark box system because there is no direction on what clicking a box does. It took me way longer then I would have liked to learn that you need to not only select the checkmark box beside the odds but also then select the type of bet you want to place on the betting slip side. See screenshot for what I mean. It just feels like more steps then necessary to place a simple bet. That being said, like anything, once you get the hang of the system it runs smoothly. All the main sports betting odds are easy to find as well as futures and prob bets. The site loads really fast and changing from betting market to market is simple and speedy. The overall look of the site is clean and easy on the eyes, so no complaints there. If anything, maybe they could use an update to adjust font sizes larger and a little more spacing between odds but that is really nitpicking. 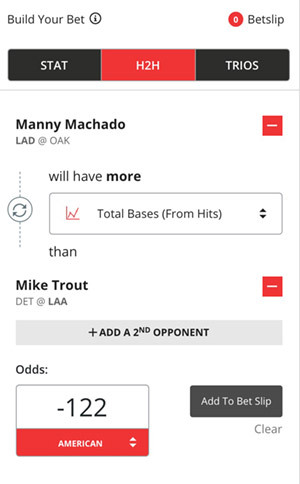 So maybe above all things mentioned in this BetOnline review the most important thing to you is likely how do their odds match up against the competition. To be honest it is hard to give a really fair assessment unless you track the odds for a long time across many different sports. So keeping that in mind I will be using a very small sample size of 3 different slates – MLB, Soccer and some future NFL Odds, so take the comparison with a grain of salt. I will compare their odds to Bet365 just because 365 is one of the most well-known sites across the betting world. On this day BetOnline was the clear winner with them having better odds for both the favorites and the underdogs for all but 2 teams (they were exact same in those 2 as Bet365). The biggest difference was with playing dogs who were on average 10 points better at BetOnline. The favorites were almost the same but BetOnline was usually better by a couple points. Next we looked at the future bets for outright winner of the 2018 Super Bowl. We compared every teams odds to win between the two sites and found BetOnline had better odds for 12 teams, they were the same for 10 teams and 365 had better odds for the remaining 10 teams. This comparison was a little bit closer but BetOnline still had the edge overall. Check out the current up to date odds at BetOnline for Super Bowl outright winner. For the final comparison we looked at soccer (or football) odds for EPL league on a slate dated August 11, 2018. Here, Bet365 took the edge with the majority of lines being slightly better in the bettors favour. The biggest difference was in taking a draw were you got better odds at 365 across the board. All in all though BetOnline’s odds were only off by a few points either way. BetOnline’s odds overall are very competitive when comparing to other sites and when compared to the one of the biggest sites in the world they were on most occasions better. Overall BetOnline has really taken huge strides since there early days in the betting landscape and are now without doubt one of the best and biggest betting sites in the world, especially for players in the North American market. They are one of the few legit sites take USA players and their cashier options are better then most sites I’ve seen. They have some issues like withdrawal fee’s and certainly could use a few updates to their interface but overall are a 1st class site for bettors. I would have no concerns using their site and trusting the company itself. Full Disclosure – We are affiliate partners with BetOnline but we are not paid in anyway to alter our reviews for the positive. Our reviews are 100% honest from reviewers who have no connection to the site. Bringing you expert sports betting content for the average punter.